Should Kids Eat Low Carb? Want to talk controversy? Say your kids eat low carb! I always cringe when someone asks a question about children on our Facebook page. It’s not that I don’t think the questions are important and legitimate. I sometimes repost them to the group because I want to help. More ideas can help! But without fail, questions about kids generate controversy. No matter the topic, the fight that ensues seems to boil down to the basic question, “Should kids eat low carb?” And man, do people have opinions! I love the fact people care so intensely for the well-being of children; I don’t always love the fervor with which emotionally-driven conclusions are delivered. But it’s hard to find anything other than emotionally-driven conclusions. I tried to locate solid research on nutritional needs of children instead of some one-size-fits-all guidelines based off of current adult recommendations, and didn’t have much luck. I searched for studies on potential dangers of low carbohydrate diets for children because that’s what you so often hear–it’s dangerous!– but all I turned up was something from 2004 where rats were fed high-fat, low-carbohydrate, and low-protein diet. I didn’t find it particularly compelling or directly translatable to the question about kids: specifically, should kids eat a low carb, moderate protein diet high in natural fats? I’m sure more scientifically-oriented folks could do a better literature review. (If you’ve got something good, link it in the comments!) But you’re going to have to wade through more speculation-delivered-as-gospel than I was able to stomachin order to find it. Heck, the research is only now beginning to hint at what low carbers have realized through experience for decades: dietary fat doesn’t give us heart disease, we don’t need grains to be healthy, and we can think clear as crystal without shoveling down bagels to fuel our brain, thank you very much. The sources I found answering the “Should kids eat low carb?” question with a screaming “No!” are the same ones perpetuating long-held myths about adult low carbing. So yeah. I was less than persuaded. But with scientific guidance or not, we still have to feed our kids. Empty phrases like “balance is the key” or “everything in moderation” sound good intuitively, but don’t mean much. Poison in moderation is still poison. No one needs a “balance” of refined foods and sugar to be healthy. Complex carbs like beans are less clear cut–there’s nutritional value. But if children are getting the nutrients they need from other places, then there’s no reason to arbitrarily insist on a particular source for those nutrients, is there? Should kids be on a diet at ALL? I suspect this question is what actually sets people off. The idea of “kids on a diet” conjures up images of control-freak parents obsessing over every morsel a toddler nibbles, accompanied with stern lectures: effectively fat-shaming preschoolers. It’s not a pretty image. It’s also almost certainly not a real image, at least not for 99% of the people asking. Most parents want to do right by their kids, and absolutely do the best they know how. Kids have to eat something, so by definition, they have a “diet” even if they are not “dieting”–significantly and specifically restricting food intake. The “normal” stuff that most kids eat–the stuff that I ate as a kid–unquestionably isn’t the best choice. Furthermore, some children do struggle with weight and the old calories-in/calories-out model isn’t cutting it for everyone. Some kids are sensitive to carbs or resistant to insulin, much like their parents. Some are advised by physicians to follow a certain protocol. Some parents may find their child has issues with gluten. There are endless, very valid scenarios where a parent may be restricting a child’s menu for the child’s health and well being. So I assume the overwhelming majority of people asking about kinds and low carb are genuinely looking to care for their children, motivated by need rather than vanity. Bottom Line: Should kids eat low carb? Every individual is different, and there’s no single dietary approach that’s right for everyone. However, it’s useful here to remember exactly what low carb is all about: natural, unprocessed food including meat, lots of vegetables, with some fruit. To be blunt, I have trouble understanding why the question, “Should kids eat low carb?” is even a debate in low carb communities. You may decide not to worry about fruit intake or not to count the carbs in veggies. You may feel comfortable with your child consuming dairy for the calcium, eating beans or even having some whole grains. You may not shoot for ketogenic, because there isn’t a lot of research on sustained ketosis for youth. But with the Standard American Diet–what most people consider “balanced”–clocking in at 50% carbs (and no doubt much of it plain ol’ sugar), I cannot imagine a single reason I would choose to follow that standard bit of conventional not-so-wise wisdom. But what I think doesn’t really matter when it comes to feeding your kids. It’s what YOU think, and do, that counts. Do your kids eat low carb? Why (or why not)? I have a 10 month los baby and I’ve decided yo keep her LC. She is breastfed still adn her food is mostly veggies and some fruit. She is growing perfectly having only natural carbs. I don’t think she should be having too much fat yet, should she? Marisol, I am not an expert on what children need to eat, just to be clear. However, a baby that is breastfed will be getting fats from the breastmilk. If you are happy and her doctor is happy, it sounds like you’re doing just fine! I don’t have kids yet, but looking at it from a strictly scientific perspective, it just doesn’t make any sense for a kid to NOT eat low carb. When applied to adults, the science says that our bodies function more optimally when it runs on ketone bodies instead of glucose…so why would this not also apply to children? Carbs, especially the refined types, have been shown to cause a plethora of chronic illnesses and have the ability to cause dangerous food addictions, so it’s only logical to keep those types of foods away from kids. Healthy fats are also super important in development (why else would breast milk be so fatty?). It’s definitely scary because of the lack of research, but it just seems illogical to me to get a kid hooked on carbs only to tell them at a certain age that the low carb lifestyle is healthier. I don’t necessarily think it’s in the kid’s best interest to totally restrict their diets (i.e., let them order spaghetti and meatballs at a restaurant once in a while), but I imagine teaching them from a young age which foods aren’t so good for them would be beneficial down the road when they start choosing what foods to eat on their own. That’s kind of my thinking, too, Steph. Not a huge amount of emphasis on food, just serving the kids more or less what you would eat yourself. Sure, they’ll sometimes eat other stuff away from home but if it’s not the norm, it’s not generally going to be that big of a deal…I know I fed my kids the way I ate, which wasn’t so good at the time! Nobody called me out as being a bad parent, at least not to my face. Ha! But then again, nobody thinks twice about a diet full of starches and plenty of sugars, not usually. But when I went low carb, my family pretty much did, too, although I sometimes added side dishes for them. And in the end, we all benefited from it. If I had it to do over again and my kids were young, we’d all be eating low carb from the outset. My daughter is 14 and started the Atkins diet with my wife and I a little over three months ago. We have all lost between 25 and 30 pounds in that time. She is a competitive softball player and just made varsity as a freshman in high school. She wants to lose more weight, but she has been maintaining a steady weight for the past few weeks while being a little less than strict on her diet. She’s happier, healthier and has more self esteem than she’s had in years. If we encounter any problems we will address them and refer to the medical advice of her physician but until then she’s continuing on as she sees fit. I support her in that decision. Oh how awesome is that! Congrats to your daughter-and the rest of the family, too. This is a great question and one I’ve wondered about recently. I just started eating low-carb, but I am also the only person in my family with any belly fat! My husband has never been a sweets kind of guy, but his dad and aunt and grandmother all died of diabetes, so it’s on his radar as something to watch out for already. My kids are pretty active, thin, and strong and seem to have no problems staying in balance. Our family does like pasta, rice, and potatoes and generally eats a pretty healthy diet that includes a good variety of food, though I think the 9yo would eat exclusively mac and cheese if I let her. But – I think if I stay very low carb and they just keep everything humming along at a reasonable level, decrease the emphasis on always having a starch at a meal (my husband insists there must be a starch! He’s 53 and has a really flat belly. It’s hard to argue with that….) make good breakfast swaps (out with high carb waffles and sugary cereals, for example), with just occasional sweets and talk about making good choices – it should be fine. 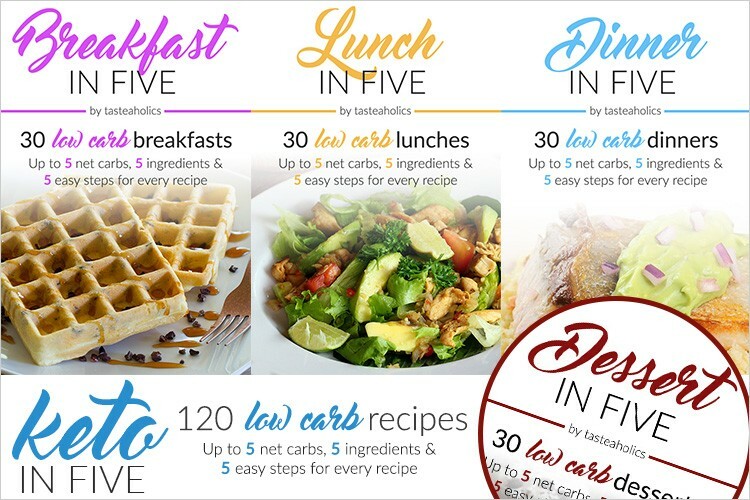 I’m still learning about this but what I am aiming for is to reduce the high glycemic load carbs, keep fat/veg/protein as centerpieces of meals, and not really fret about their macros. I think right now my job for them is to maintain their healthy insulin system, but it doesn’t need repair like mine does. I don’t want them to start freaking out about food this young and think that cake is bad. All cake, all day is bad. But some cake is OK if your body is handing sugar like it should, which mine is not right now. Thanks for bringing this up because I do think it’s important and can see why it’s hard to really settle on an answer for our kids! That was very much how I handled it with my family, when I started low carbing. I made what I would eat, and added a starch for them. My kids were older than yours but eventually, everybody was eating more like me (because heck, I made the food)! I don’t think kids need to be freaked out over food choices, but most could do with less of the sugars so maybe they won’t have the struggles some of us do now later in life. Thanks for sharing your thoughts, HS. I was put on a low carb diet by my pediatrician way back in 1968. Parents fed me like a farm hand and I had ballooned up to 140 pounds by the time I was in the 4th grade. I lost 25 pounds in about 6 weeks, felt great and my clothes were hanging off of me. And then I caught a cold so mom decided that making pancakes again for breakfast was good for me… Parents! In 2009 I went low carb, lost 75 pounds and haven’t looked back. Did discover that Keto is not for me, I put on 30 pounds from all the fat(calories do count as far as my body is concerned) Currently maintaining 120 pounds for the last 3 years with 20c/71f/100p. Wow! That’s impressive and a perfect example of how important it is, learning what works for your body. There is no one-size-fits-all approach. Congrats on your success, Kim!! That’s wonderful.